According to a press release issued by the Social Investment Fund (SIF) dated September 17, 2013, four members of staff have been terminated by SIF’s Board of Directors based on findings documented in a Contractor General report. This followed an emergency meeting that was held by the Board of Directors late Monday evening. The meeting was convened following allegations of rampant corruption that have recently surfaced, including accusations of extortion within the Social Investment Fund connected to a botched $1.3M renovation project that was to be carried out at the Dangriga Town Market as part of the Municipal Development Project. In an interview with Channel 5 on Tuesday, Hon. Santiago Castillo, Jr., Minister of State in the Ministry of Economic Development, confirmed that the four staffers, who were not named in the release, are Mike Hernandez, the former Director of Public Relations; Lionel Jimenez, who worked as an engineer on the market; financial officer Enrique Romero; and Fausto Pineda, a technical officer. Earlier this week, Amandala reported that the Corozal-based contractor for the Dangriga market project, Kenard Smart of K & G Construction, had sent a letter to the Contractor General in February of this year claiming that he had allegedly been “extorted” by at least four of SIF’s employees, to whom he had given checks over a three-year period, between 2009 and 2012. Smart went as far as to provide copies of the financial transactions with the names of the recipients who allegedly “sabotaged” him and denied him several contracts that he had supposedly won. The exhibits were made public through the media, and show correspondence indicating that Mike Hernandez had received a check for $500; Lionel Jimenez was paid a check for $5,000; Enrique Romero had received a check for $1,000; and Fausto Pineda got a check for $3,000. 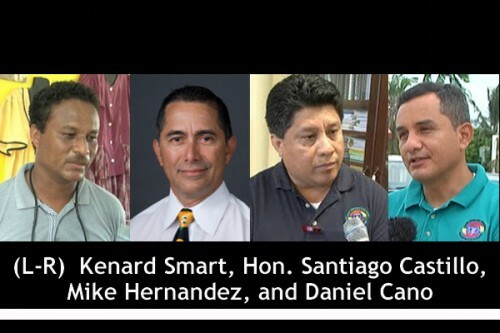 We were not able to contact any of the other employees directly to hear their side of the story, but Mike Hernandez, in an interview with Channel 7 on Tuesday, explained that the check that was issued to him was given as a Christmas gift by the same contractor, Kenard Smart, who then turned around and accused Hernandez and the other SIF employees of corruption when he could not fulfill his obligations to complete the project on time due to financial woes. In his defense, Hernandez responded to the allegations against him and fired back at Smart for dragging him into the now messy situation, which, according to Hernandez, was caused by Smart’s own incompetence. Hernandez stated, in the same interview with Channel 7 News, that he is displeased with the manner in which he and the others were let go, and insisted that he was in no way involved in any sort of corruption at SIF. Hernandez said, “I have to state that I am very disappointed in the manner in which it was done. It was done very unprofessionally and very disrespectfully. The normal course of things should have been they should have called us in and say to us that this is what the board has decided and out of courtesy this is what is going to happen. This thing went public; they sent a press release and we found out through the press release. That is very unprofessional and very bad on the part of the chairlady of the board of directors of SIF. Be reminded that SIF is an institution that is one of the best institutions throughout the entire Caribbean region. We also understand that all the persons who admitted to receiving monies from Smart stated that they had a legitimate reason for receiving such funds. The $5,000 check for Jimenez , for instance, was supposedly a loan from Smart; the $3,000 for Pineda reportedly was for an insurance payment to his wife; Hernandez’s $500 check was said to be a Christmas gift; and another SIF officer was reportedly conveying money to one of Smart’s female companions on the contractor’s behalf. As for the former Executive Director, Daniel Cano, he was allowed to tender his resignation from the post in lieu of termination, which was “in the best interest of the organization,” according to the press release. Smart, in his letter to the Contractor General, Godwin Arzu, mentioned that he had reported the situation to Cano, who was given the checks and check stubs, but Cano later ignored the matter. Furthermore, Smart alleged to the Contractor General, that Cano was also a part of the scheme to “sabotage” him by refusing to give him projects that he had bid for, and even cancelling one of his projects in Santa Elena. On top of that, the developer alluded to Cano and a sizeable amount of money, describing in the letter to Arzu where and how he delivered the money, but no solid proof was provided to substantiate the allegation. Cano, in any event, has since categorically denied those allegations, but was also found to have taken on a side job, despite SIF’s regulations which prohibit such activity. The press release ends by saying that the Social Investment Fund has made arrangements for temporary management until a new executive director is hired. We understand that former Sports Director Nellie Trench has been appointed as the interim Executive Director.